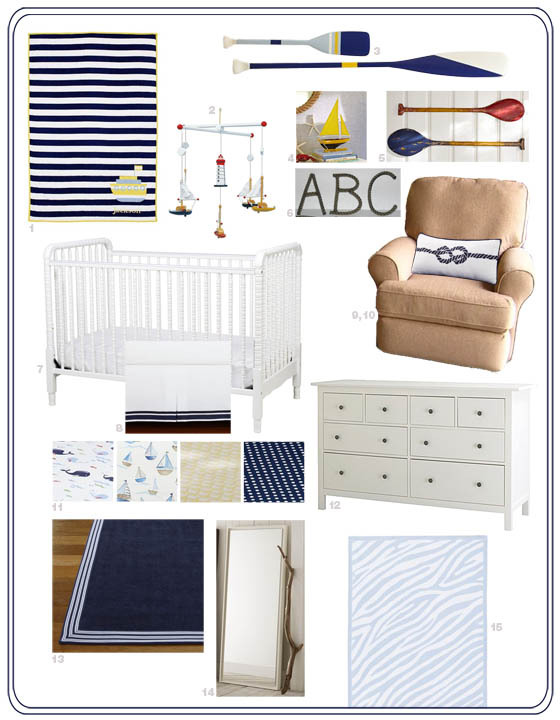 Here's my mood board for Baby D's nursery. I've always loved nautical decor - it evokes happy summer memories for me. Since I wanted something appropriate for a baby boy, but not too cutesy, it was the perfect decor style. My first stop for inspiration was Pottery Barn Kids - they have a great selection of nautical merchandise. From there, I used Pinterest and Google to finish off my mood board. I'm delighted to report that we've nearly received or bought everything from above. Now, we just have to figure out where the nursery will actually be (since we're in the process of selling and moving). Someday it will all come together perfectly, but for now all I can pray for is a happy, healthy baby boy! I cannot wait to see photos of your completed nursery...as I am sure you cannot wait to complete it! The mood board is ADORABLE!